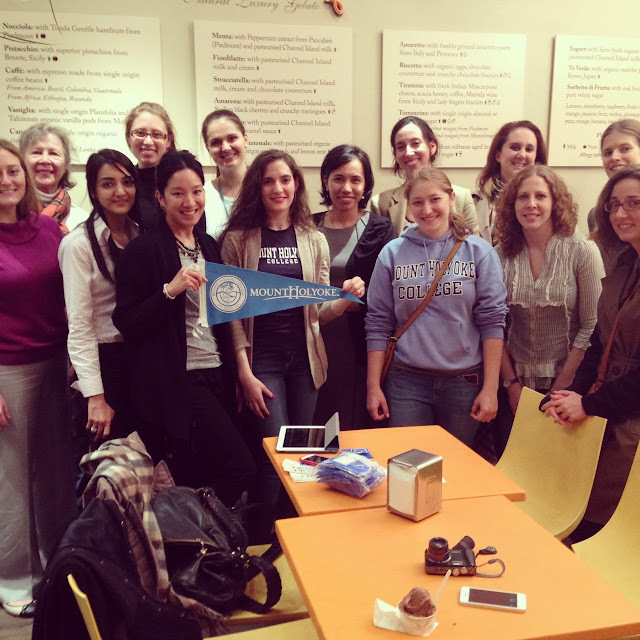 Yesterday was Mountain Day at Mount Holyoke, so a group of us alums (plus two study abroad students - Class of 2015! I feel so old!) met up at 18:37 (natch) after work for ice cream at Scoop in Soho. I went home afterward to my husband and announced, "I'm in SUUUCHHH a good mood today! You know why? (dramatic pause) BECAUSE IT'S MOUNTAIN DAY." He looked up briefly from his work to smile and exclaim, "Yay! Congrats!" I shot him a withering look. "That is not what you say on Mountain Day," I said with great disdain. Mountain Day is a long-held tradition at Mount Holyoke (and indeed, at a select number of other East Coast colleges) whereby the church bells ringing on a sunny but brisk autumnal day signal the cancellation of all classes and a trek up Mount Holyoke in Skinner State Park. At the top, ice cream is served, the alma mater is sung, and students take turns snapping photos with the backdrop of New England's fall foliage behind them - photos that end up in yearbooks and picture frames long after they've graduated. I remember not my first, but my second, Mountain Day at Mount Holyoke: it was my sophomore year and I was still relatively excited about anything that was vaguely traditional. I gulped down far too much coffee at breakfast, met Udita at the bottom of the mountain and convinced us both that it was a "race" and if we didn't run up to the top, "they" would eventually "get us". To this day, I have no idea who this fictitious "they" were, but we sure got to the top in a hurry. I think there might even be a short video floating around of our ascent to the top; us laughing and panting as we laughed over numerous inside jokes and attempted yoga poses on slippery rocks. Today, Mountain Day holds a different kind of significance for me. As an ex-pat living in London for over six years now, I let out a silent cheer from my office desk yesterday when the Mountain Day announcement lit up on my phone around noon and quickly took over my Facebook newsfeed. I was so excited to see other alumnae that evening and indulge in a tradition that never really left us - not even after graduation. At Scoop, I caught up with a few alumnae I'd met before, plus some I hadn't, including two students who were currently studying abroad at Queen Mary. When they answered my question, "What class are you?" with an enthusiastic, "2015!" it made my heart melt. I recognized that excitement and enthusiasm in my own junior-year-abroad eyes. I quickly scanned back to the year I was studying abroad in England, at Oxford, and desperately tried to recall all that I was thinking and feeling at that time. What was it like? It was impossible for me to capture that moment again, but being in that room with fourteen other Mount Holyoke women made me feel, in an instant, at home. Our shared experiences of Chef Jeff cookies, bats near the 'Delles, library carrels, brunch in Ham MacGregor, elfing, convocation, Canoe Sing, and numerous other characteristics that make Mount Holyoke a truly unique place to live and study for four years made us both classmates and sisters, in a sense. I remarked to another alum ('96) that I loathed the word "sisterhood", yet I couldn't think of a more applicable term to describe that feeling of togetherness. Often, when I head home after work on the 38, staring out the dark windows as the bus pulls up to Angel, I feel very much alone. My journey in and out of central London consists of small moments of loneliness on buses, tube trains, by foot, which are then interrupted by longer lengths of familiarity as I arrive to greet my colleagues and friends at work, at the gym, at orchestra rehearsal, in my small rented flat in North London. But not that night. As I got off the bus in Islington and walked the short walk home without my music in for once, my hands still sticky with ice-cream, I thought of Mount Holyoke's often-used motto: "Uncommon women on common ground". And I thought of that evening eating ice-cream at Scoop in London: aren't we actually common women on uncommon ground? In this still unfamiliar place that I'm reticent to call home, I'll still have that - this network of brilliant women, both old and new, existing and breathing and moving and shaking in this strange, lonely city of mine. And I threw my head back and laughed because that thought was comforting to me. Happy Mountain Day, Mount Holyoke. Aww this choked me up! I miss Mount Holyoke so much. I like your reflection on the motto -- I think you're right, our time at MHC gives us something in common and sends us out across the world. I emailed yesterday with one of the women who volunteers at my museum and is a Mount Holyoke alum from 1956 -- she said she was enjoying the beautiful Mountain Day weather before heading to the airport for a trip to Jordan. I sure hope she and I have something in common! Alix, at least Shawn knows about Mountain Day! When I explained it to John, he just shook his head and said, "You lot are so strange." Too bad he had a below average college experience compared to mine, haha! I loved your comment above - thank you for sharing. I have similar feelings about 'sisterhood' and it's in-spite-of-my-hatred applicability... I know my bias is showing, but I can't help feeling like everyone had a below average college experience compared to ours. I just can't imagine anything else holding up over time and distance this way. I was on campus last weekend for a friend's birthday and it was like no time had passed-- the nostalgia and love overwhelmed me, the persistent familiarity of everything, the *feel* of it enduring even when the physical things have changed. Finding another alum is like making an instant friend. Do alums of other schools feel this way? Maybe some. But I don't know any. Yes, kind Ms. Angloyankophile, thanks for the post. Love the range of technology scattered across the table in this picture - and then the ubiquitous blue MHC sweatshirt near front and center! LOL Like MHC, it will never die! Emily Anne, my bias as well as experiences mirror yours. When I find myself immediately getting along with a woman I have just met and fallen into interesting, passionate conversation with, I have learned to ask, "Where did you go to school?" Every one of these people have known 'school' meant college. And all of them went to at least a Seven Sisters school or MHC! :D (Hey, got to give it up for other superlative, educated women, right? They 'get' us.) Rather hilariously, every time these other women and I discovered this we were like, "Oh, no wonder I like you / am enjoying talking with you!" A Smithie friend whom I've come to know was thrilled to learn MHC's Mountain Day had been declared. Yes, she said, Smith has one, too. Since we didn't know when theirs is/was for this year, I nominated her to be an honorary one of us. :) She accepted, then asked where we should meet for ice cream! Emily, you hit the nail on the head. Three of my best friends from MHC attended my wedding reception this summer and, tearful upon having to leave each other after a hilariously fun weekend, we agreed that MHC forms friendships like no other. I LOVE YOU! Thanks for this lovely and poignant post. Happy (day after) Mountain Day to you, dear friend. Mount Holyoke forever shall be!